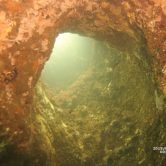 The Gooseberry island Arches are a great dive site that I call the “Caribbean of Newport” Typical viz is 15-30 ft. and you’ll want to bring your camera to this photogenic site teaming with fish and marine life. There are swim-throughs, lots of canyons and many vertical walls to explore. We’re leaving at 8:30am show up at 7:45-8:00 am to load gear WE LEAVE @ 8:30. Cost: $120.00 depth: 40 ft. Reservations are made by full pre-payment that is non refundable if you cancel your reservation….. you forfeit the full payment unless we can sell your seat. If our captain cancels the trip, we issue a full refund.Cancellations by our Captain are made on the day of the charter, one hour before sailing time. We cannot guarantee dive sites, alternate dive site selection does not constitute a cancellation or a refund. Please be at the slip which is Connanicut Marina Jamestown, RI 02879, to board “Argonaut” 1/2 hour before sailing time, to fill out a waiver, present a certification card and get fully loaded 15 minutes before departure time. Our boats sail on time and if you miss the boat it’s your loss. Sign up now as these charters sell out quickly. Your seat is held by full prepayment only.